The parents and sister of Will Sims, a young black man killed in El Sobrante in 2016, discuss his murder and impact on the family. 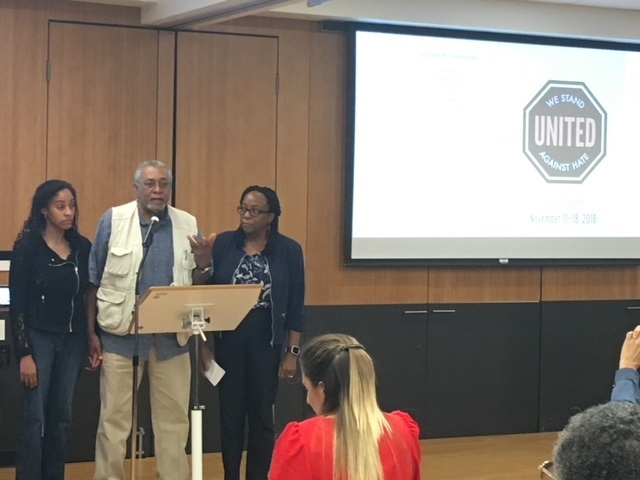 On September 26, elected leaders and community members from a half dozen cities across the Bay Area gathered in Berkeley to launch United Against Hate Week, a campaign to stop the hate that threatens the safety and civility of our communities. From November 11-18, leaders will call for and support civic actions by local residents to oppose the rising tide of hate. It was inspired by the region’s "Stand United Against Hate" poster campaign in the aftermath of last year’s violent rallies in Charlottesville, Virginia. Emeryville Mayor John J. Bauters recalled experiencing hate crimes as a gay teenager growing up in the Midwest. While individuals may think they can’t make a difference, he said it’s vital that they become involved -- which can be as simple as getting to know someone with a different background or listening to someone with a different point of view. The event also unveiled “STOP HATE Action Kits” – resources and guides for schools, communities, law enforcement, and campus groups. The kits, created by Not In Our Town in partnership with the Lawyers’ Committee for Civil Rights, are available online at stophateaction.org and through a link on the United Against Hate Week website. The first year goal for UAH is ambitious -- to get 25 of the Bay Area’s 100 communities to participate in UAH Week.